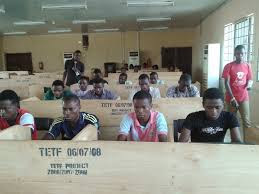 Lautech security men drove into the examination center on Thursday when information reached them that some set of students are engaging in examination malpractices . Students are running into different directions and the security men went directly to their victims and fished them out . After the whole drama , 6 students were arrested and dragged into the van , 2 went away and 1 injured himself in the bid of running .